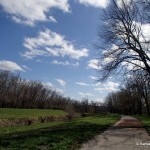 Kansas will celebrate National Trails Day on June 1st, with events and festivities in communities throughout the state. Southwind Rail Trail Dedication, Andover To Augusta Rail Trail Project, Proposed Trail To Link Flint Hills Trail With Melvern Lake, Tips On Surfacing Rail-Trails, Abilene Designated One Of Best Small Towns In America, and more trail news from across Kansas. A recent letter in the McPherson Sentinel urges County Commissioners to see through the lies from anti-trail zealots, and to 'educate themselves on the benefits of trails and their positive impact on communities'. Air Capital Memorial Park Singletrack is holding their Grand Opening party on Saturday, May 18th from 10am-12pm, to showcase this new addition to the Wichita bicycling scene. The final steps are being completed on the Meadowlark Trail, which will stretch between McPherson and Lindsborg in central Kansas. New legislation has been signed into law in Oklahoma, establishing the Historic Chisholm Trail Bike Route through the state, from Texas to Kansas. 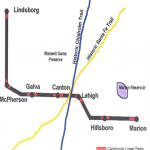 There is not yet an official Chisholm Trail route in Kansas. Earlier this year, the Sunflower Foundation awarded grants to Kansas communities to build, expand, improve and connect their trails. The deadline for the next round of grants is May 1st. Trail news from Wichita and south-central Kansas, courtesy of the Kansas Singletrack Society, including Miller's Meadow, Fall River, and Air Capital Memorial Park Singletrack. Exploring a bit of the Little Blue Trace Trail in Independence, Missouri.